Send a golden thank you gift! A Golden Thank You. A golden way to send your sincere gratitude! 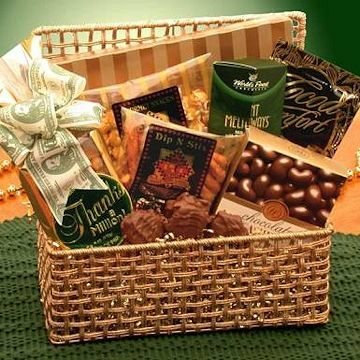 This glittering gold hamper is a one of a kind unique gift combined with delicious gourmet treats its sure to leave lastig memories of your generosity and thoughtfulness. This gift includes the following: Gold Chest w/ Lid, Cheddar Cheese Pretzel Sticks, 2 oz Crunchy Vanilla Cinnamon Caramel Corn, Chocolate Covered Almonds, Mint Chocolates, Gourmet Cappuccino, Caramel Chocolate Nut Chews, Thanks A Million Theme Bag w/ Snack Mix.